Cafe Pasión is a new opportunity to write, discuss, explore, learn and share about everything coffee has to offer. When I was applying for a position at the Guatemalan Coffee Association, in 1999, Liz Rodriguez, as promotion coordinator, asked me about my thoughts towards coffee. My answered was very limited: “it is the main foreign exchange of the country”. I never imagined coffee could have been so much more. The first thing I learned about coffee was its complexity. Producing coffee, as it could be with any other agricultural product, is one of the most demanding and strict activities there is. Choosing the right seed from the best plants, sowing them in a proper soil, feeding and using the adequate fertilizer, nourishing the plantation for three or four years before giving the first crop, praying that the weather is benevolent enough not to waist the blossom so the cherries can ripen , finding people willing to harvest the beans, building and maintaining the wet mill in optimum conditions to process the cherries, storing the parchment, finding a buyer that is conscious about all this work so that the price is reasonable to make a profit! As soon as I had understood that, I found that roasting and then brewing coffee was even more complex. It also has its own contradictions. While it is the world’s most widely traded tropical agricultural commodity with an estimated US$ 15.4 billion exports in 2009/2010 according to the International Coffee Organization, it is grown in undeveloped countries where 1.4 billion people are living on less than US$1.25 a day, revealed by the World Bank in 2008. If you take a brief look at how the politics of trading coffee were and how efficient, dynamic and sophisticated they are now, you would probably agree that there is nothing more fascinating than following the wide and diverse path of this noble beverage that conquers our palate and stimulates our soul. That is the reason behind “Café Pasión” (Coffee passion). The essence of coffee has invaded so many human beings around the globe that their dedication, efforts and passion is contagious and cannot be unnoticed. It is one of those feelings one wish to irradiate and maybe, just maybe, it could be and excuse to find a way of making life better. 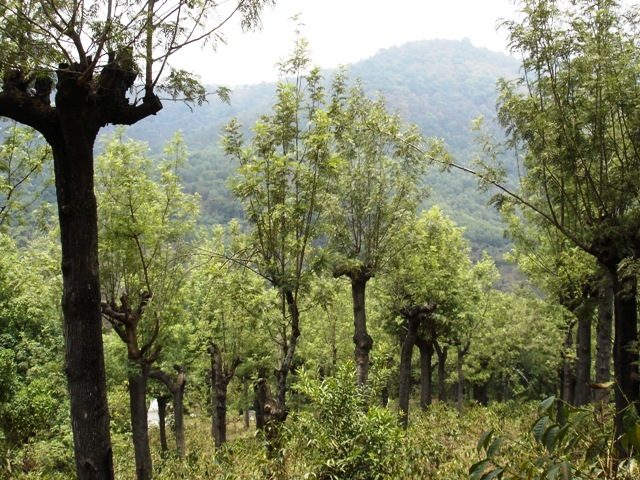 View of shadow trees called “Gravileas” at Santa Felisa Farm, located in Acatenango, Chimaltenango.